Any communication generated through lucky mobile number always successful. Unlucky number makes struggles. So, out of lucky mobile number, you will get very positive results. Thank you Dr.SS.This message is the mirror of achievement of dedication,hard work and perfection in numerology which have changed my life towards specific goal through my personal experience. All good regards from me to u.Its surprising for me that ur every word nd every predctns were proved true till nw. I knw u r very brilliant personality. I think my past will never come but in future I will take ur suggestions as per ur numerology always. My good wishes r always with u . U will be gr8 numerologst . Thanks for all good suggestions as per ur numerology. This is to inform you that I have consulted Dr.Sengottuvel for his numerology skills number of times and they have proved extremely accurate and very benefecial.He is very good at his suggestion. Dear Dr.Sengottuvel first of all congratulations on your brand new website. it look like just yesterday's evening that in boys group a young boy explaining us what is numerology and now that young boy is new shining star in world of Numerology.It is my great privilege that I was the part your wonderful journey many good wishes for career. 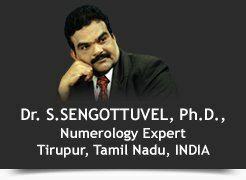 Dr.Sengottuvel is the person who make me believe that numerology has the power that can help us build our own future. The occasion was 2012 election when all odds are against me but Dr.Sengottuvel predicted that victory will be ours and as per his prediction I have won that election comprehensively. Now I always consult Dr.Sengottuvel before starting any new venture ,as he is the master of numerology predictions, I wish him best luck for his future. Potential must convert into productivity . The miracles always happens in his numerology . He simplifies all things with respect to personality , such as marriage , job , fields that can suitable to our numbers . So Mr.Sengottuvel go ahead we are all with you. Thanks Dr.Sengottuvel for your help. I must say numerology really works. I feel better and my life seems to be so much different, more positive people are attracted to my energy vibrations. I have been so impressed based name correction reading that I got it done for both of my sons also. Life altered after adding an extra "A" in my name. Your advice brought many wonderful opportunities in my life. Thanks to you Dr.Sengottuvel. Dear Dr.Sengottuvel I want to thank you very much for all the work and effort you put into my Chart. After changing my name, my life is totally different. Everything positive seems to be coming my ways. I got a better job and met some very helpful new friends. Negative thoughts have just vanished. I can now feel positive vibrations all around me. It's just wonderful.